The book of Krister Holmberg serves as an excellent starting point for anyone that wants to know more about available options with respect to increasing the solid content of solvent based coatings. The topic is gaining in interest now that the use of solvents becomes more and more under pressure. Also, it becomes clear that waterbased coatings have their limitations especially in applications in which temperature and humidity are difficult to control. 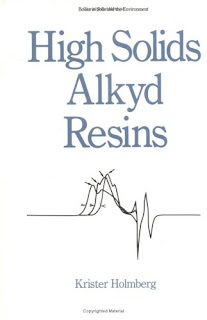 The key concepts that can be used to improve properties of high solids alkyds are discussed in a clear and illustrative way, for example: control of molecular weight, choice of solvent, reactive diluents and branching. Despite the book being published in 1987, the concepts are still valid. Possibly the time has come for an update that includes the latest developments especially with respect to hyperbranched technology.